The Eagles might want their franchise QB to emulate this guy. ATLANTA – When Tom Brady was a kid, he would break video game remote controls, he would punch holes into walls, and he would slam his golf clubs into the ground all in the name of competition. Brady, as an adult, hasn’t changed very much. His Patriots teammates have told stories about broken paddles and tossed backgammon boards. On the field, the quarterback can sometimes look like a man possessed. His sideline tirades are infamous. The ageless 41-year-old’s outward behavior can be just one manifestation of his type-A personality, though. 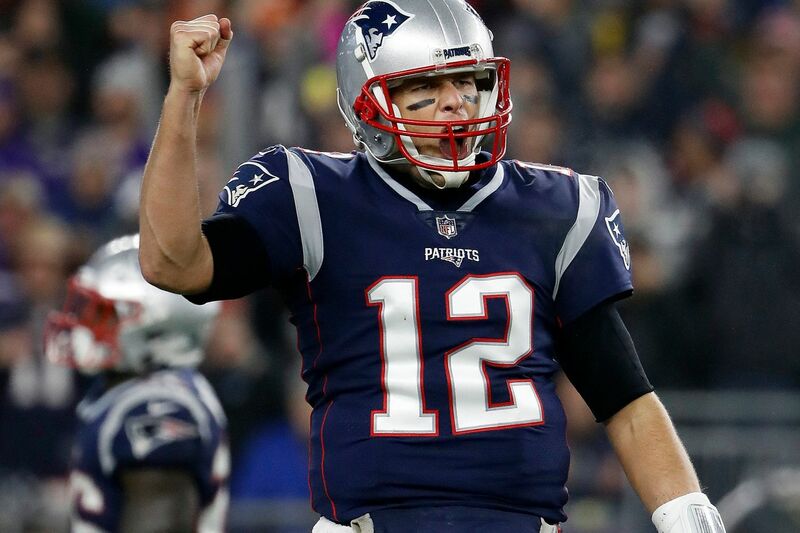 Brady’s success at the highest level of football – he’ll try to add to his already-NFL record of five Super Bowl victories Sunday against the Rams -- is the most overt example of his competitiveness. Brady does have great height and size, if not speed, and many of the intangibles it takes to play quarterback in the NFL. But he’s right in that he doesn’t have one physical skill that is considered among the best. It’s one reason he wasn’t drafted until the sixth round. But Brady’s ambition – maybe the greatest in the annals of sport – is likely the No. 1 reason he’s generally considered the best ever at his position. And it’s why his once-ridiculed assertion that he wanted to play until he was 45 no longer seems like a pipe dream. For most NFL quarterbacks, competitiveness is a necessary character trait. Coaches and scouts often want to see a certain amount of drive in prospects. Quarterbacks of all stripes have won Super Bowls. But they often have personalities that can be described as type-A, and often type-A-plus. But there are negatives that come with having a type-A disposition, and playing with quarterbacks who are aggressive can wear on teammates. Peyton Manning had some struggles early in his career. Aaron Rodgers has had problems with teammates. Simms said that he would sometimes push the envelope too far. The list goes on and on. But those quarterbacks typically have one thing in common – besides winning – and it’s backing their words with actions. Eagles quarterback Carson Wentz has been described the same way. He likely isn’t where he is unless he was uncompromisingly motivated. But there’s a thin line. And there are also many ways to skin a cat. Joe Montana was known for his “Joe Cool” demeanor. The Rams’ Jared Goff doesn’t shy from descriptions that he’s “laid back.” Nick Foles is about as accommodating as quarterbacks come. “He’s going to be the nicest guy you’ve ever played with,” Eagles safety Malcolm Jenkins said of the Eagles backup. “Always encouraging, always positive no matter what the situation is; he just has that vibe about him. But there’s a whole spectrum. But Brady has, because of his triumphs, become the archetype. His competitiveness has become part of his legend, more than his talents, his good looks, his supermodel wife, Gisele, the workout regimen, the brain exercises, and the avocado ice cream. It’s so intense that examples from teammates past and present ease out from behind the Patriots’ code of silence. Darrelle Revis once called Brady’s competitiveness a “sickness.” Danny Amendola said Brady once broke a paddle after he lost to him in ping-pong. Damien Huard said Brady chucked a backgammon board after another defeat. Brian Hoyer once recalled the time Brady was goaded into a beer-chugging competition, even though he hardly drinks anymore, and won. In games, Brady isn’t shy about yelling at his receivers for running wrong routes or his linemen for not blocking, although he has gotten better with his body language. Mostly, he just takes his frustrations out on himself. But there is much more to Brady’s type-A personality than just his explosions. He’s disciplined in training. He’s meticulous in preparation. And he’s scrupulous in practice. When receiver Chris Hogan first signed with the Patriots, he struggled to find a rhythm with the quarterback. “It didn’t take me long before I was taking a lap for jumping offsides,” he said. Brady, though, kept the dialogue going with Hogan, especially on plays in which the receiver hadn’t run deep routes the way the quarterback wanted them. It was off to the film room. “It wasn’t one of those things where it was like, ‘Hey, maybe if you have time to do this.’ It’s, no, ‘I’m going to show you this. We’re going to watch it together and we’re going to be on the same page because if we hit this it’s going to be a big play in the game,’ ” Hogan said. “He takes every single play so seriously. But Brady said he also knows how to turn it off when he’s away from football. It was Brady’s father, Tom Sr., who revealed earlier Tuesday on ESPN that his son would have tantrums as a child. The younger Brady recalled the time his father took him to the car after a particularly frustrating day on the golf course and told him he wouldn’t take him back if he kept behaving that way. Tom said he cried and his father gave him another opportunity. Luck has played a part in his longevity. He has certainly benefited from playing for coach Bill Belichick, although it’s difficult to say who has more to do with the 207 regular-season wins, 29 postseason wins, nine Super Bowl appearances, and five Lombardi Trophies they’ve shared. Nevertheless, Brady’s commitment even as he approaches an unheard-of age for starting NFL quarterbacks is a constant. Just a month ago, however, some were writing the obituary of Brady and the Patriots’ unparalleled dynasty. They had lost back-to-back games in December, giving them five regular-season losses for the first time in nine years, and even though New England beat the Bills the following week, Brady’s passes were all over the place. It being Father Time. But every time he’s been doubted, Brady has come back with a vengeance. He was excellent in the season-finale win over the New York Jets, and after the playoff bye, was back to vintage Brady in divisional and AFC championship game wins over the Chargers and Chiefs. There have since been reports that Brady was dealing with a knee injury. When the Patriots have lost in the Super Bowl – to the Giants in 2007 and 2011 and last year to the Eagles – it hasn’t been because of Brady. He had a combined 96.6 passer rating in those three games. The 24-year-old Goff is in many ways, Brady’s opposite, and it goes beyond their 17-year age difference. They’re both from California, and of course successful NFL quarterbacks, but that’s about where the similarities end. Goff’s teammates and coaches have talked about his inner ambition, and that he’ll pick his spots when to speak up, but he has an easygoing way about him. Rams quarterbacks coach Zac Taylor said that Goff’s nature allows him to stay consistent through ups and downs. “I think every leader can lead differently. What’s important is that you’re yourself and don’t try to be something you’re not,” Taylor said. “So a lot of time people do have this box that they try to put the quarterbacks in and they got to lead this certain way. Kurt Warner took a similar approach during his 12 NFL seasons. The Hall of Fame quarterback said that leading by example – showing up first to work and showing teammates how to prepare and practice like a professional – and relating to each player was how he got the locker room behind him. Simms said he regretted the “so many unbelievably horrible things” he used to say to Giants center Bart Oates, but he knew that he could handle it. Some couldn’t. Wentz threw his helmet after he tossed an interception in the Saints game in November, but that was about the furthest he’s gone in terms of having a negative reaction on the field. Jenkins said that he’s yet to see the 26-year-old quarterback get in another player’s face. But there may come a time when Wentz may have to call out a teammate, and having that kind of weight in the locker room usually comes with time – and success. And nobody has won more than Brady.